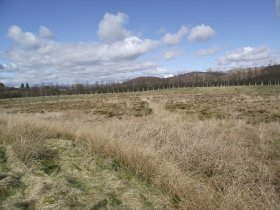 Just over the fence from the woodland area of Dyke Farm Nature Reserve lies a large open field, part of the Moffat & District Community Nature Reserve (MDCNR). At the far side of this field lies a fenced off area covered in mosses. It is what is known to the more senior country people as a 'shaky bog', this implying that it has no firm foundation and may well be a blanket of mosses lying over water. This is the Lint Pool indicated on the maps of the MDCNR. Many people have asked where the name of 'Lint Pool' originates as it does not immediately appears to be a pool. The only water to be seen is where a small excavation has been done in one corner to give a breeding area for aquatic insects. A 'Lint Pool' is a pool of water, often stagnant, in which flax stems were soaked before removal of the fibres used in the manufacture of linen. These pools were once common throughout Britain. Lint probably gets its name from the Latin 'linteus' - a cloth made from natural fibre, usually flax. This is found as 'linette' in Old French and, in Old English, 'linet'. Before the days of man-made fibres, flax (with cotton and wool) was a main source of cloth manufacture and gave us the term 'linen' we are all familiar with. Flax was grown widely in the area from Europe across to East Asia - a major industry. The flax plant (Linum usitatissimum) is also commonly known as linseed (derived from 'lint seed) as the seed is used for the production of linseed oil, although L.flavum, a shorter stemmed variety, is normally grown for this purpose. Flax requires a rich, well-cultivated soil and a reasonably temperate climate. It is sown in spring in a similar manner to oats, wheat or barley, to produce a long tightly-packed growth some 2½ to 3 feet tall. The flowers form a cluster at the top usually sky blue (The Wee Blue Blossom) although some new strains of flax are white. In autumn the flowers wither and seed balls are formed, harvesting being done before the seed balls start to open. Harvesting for fibre is normally done by uprooting the whole plant to get the maximum length of fibre. If the seed is not required, the plants are transferred immediately to the 'retting' stage otherwise it is first left in the field to dry and then a simple threshing is undertaken to remove the seed before 'retting' takes place to obtain the fibre. Seed may be retained for sowing in the following year or sent off for the production of linseed oil. Basically, the flax plant stem is made up of various layers with the bundles of fibre near the outside and woody matter on the inside, all bound together with pectin, which is a natural gummy substance, and a tough outer skin or 'straw'. One of the layers contains the fibre that now has to be extracted from the rest of the stem. The woody matter and pith has to be broken down and removed to release the fibre. This is the 'retting' process and is nothing more than rotting away the unwanted material. The plants are bundled and then immersed in water - often in stagnant or near stagnant ponds - hence the origin of the name 'lint pool'. This essentially leaves a hollow stem with the fibre layer enclosed within the outermost skin layer. The process also breaks down the pectins that bind the fibres together and softens the fibres. Local knowledge was needed to know how long to soak the flax, excessive time would damage the fibres while too short a time would not give time for the unwanted material to rot away. After retting. the next step is to separate the fibres from the remaining material (straw) that surrounds the fibres. Two methods were used, either crushing to break the outer sheath or by scraping (scutching) to remove part of the sheath to allow easy removal of the rest. The fibres are then exposed. The last stage is the 'heckling' where the stalks are passed through a series of combs or rollers to separate the fibres from the remaining material. The best fibres are used for spinning into the threads used for weaving linen cloth while the coarser ones, perhaps still containing some traces of the outer straw, are more suited to making ropes, cords or sacking. Before the advent of man-made fibres and the popularity of cotton, flax growing was a major industry. In communities where flax was grown intensively there was often also a local weaving mill but mainly the fibres had to travel much further afield. Over time, the pools generally became quite acidic, a condition favoured by many mosses. It is no surprise, that since the pools became abandoned, that mosses have flourished and completely covered over the water giving us these 'shaky bogs'. It would be unwise to try walking on one as it would be likely that you would break through the moss covering and become stranded with little hope of escape. Incidentally, there is a local rumour that, back in the days when the pool was in use, a horse and cart slipped inadvertently into the pool, efforts to recover them were not successful and their remains are still in there!